Find free classified ads for Antiques for sale, collectibles for sale for sale and to buy in Hereford. Shown below are classifieds for Antiques for sale, collectibles for sale. Please use search box above to find other items in Antiques for sale, collectibles for sale Hereford or look at the Hereford for neighboring places in the locality. 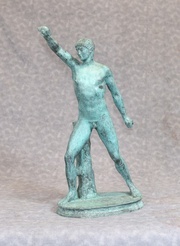 - Wonderful bronze statue of a Greek athlete - Piece is in the classical antiquity style - Wonderful how the artist has captured the proportions and form to the male physique - Green patina to the bronze - Please let us know if you would like to view this piece in our Canonbury Antiques Herts showroom, . Take away home the royal looking antique French Hearth shaped armchair from the best antique collection at Canonbury Antiques. - Come view in our Hertfordshire antiques showroom, just 25 minutes north of London. - Gorgeous pair of French Empire armchairs - or fauteils. - Classy pair and very comfortable to sit in. 3 handmade linocut Christmas cards. The design is printed straight onto recycled paper & then mounted onto cream coloured card. Each card is individual and unique as I print them by hand. Inside of card is left blank for your own personal message. card measures approx. 100x140mm. Contents include 3 cards & 3 red envelopes all carefully wrapped and packaged to ensure a safe arrival. 3 handmade linocut Christmas cards. The design is printed straight onto lining paper & then mounted onto cream coloured card. Each card is individual and unique as I print them by hand. Inside of card is left blank for your own personal message. card measures approx. 100x140mm. Contents include 3 cards & 3 red envelopes all carefully wrapped and packaged to ensure a safe arrival. Full New Collection of Border Fine Arts Figurines - Border Fine Arts Figurines New 2009 Collections available Classic and Studio. See website for details www.philipmorris.uk.com - Price: From £9.95. George Best AutoGraphed Beer Mat 100% Genuine - George Best Autographed Beer Mat , Genuine Hand signed. Aquired by my father in the 70s , good condition. Good collectors item for a football fan. offers. contact me XXXX@hotmail.co.uk - Price: offers. United Kingdom free classified ads for Antiques for sale, collectibles for sale, Hereford, Antiques for sale, collectibles for sale free ads Hereford, Antiques for sale, collectibles for sale for sale Hereford, Antiques for sale, collectibles for sale to buy in Hereford. This page is a listing of classified ads for Antiques for sale, collectibles for sale category in Hereford. This section includes classifieds for sale and to buy in Hereford. Antiques for sale, collectibles for sale Hereford ads Hereford, Antiques for sale, collectibles for sale classifieds Hereford, Antiques for sale, collectibles for sale free ads Hereford, ads for sale Hereford, ads to buy Hereford, FREEADS in UK. Find here ads for sale, to buy and rent in Hereford. Goods for sale in Hereford, vehicles for sale in Hereford, Hereford real estate for sale, Hereford property for sale, property for rent in Hereford, business ads in Hereford, Hereford business classifieds, services in Hereford, Hereford services ads, jobs in Hereford, pets for sale in Hereford, Hereford dating, Hereford cars for sale.